A teenager from Bethesda, Maryland, didn't expect to win the gold medal, but now is the national champion for his age group in fencing. See photos and video of the local fencer. WASHINGTON — A teenager from Bethesda, Maryland, didn’t expect to win the gold medal, but now is the national champion for his age group in fencing. Hundreds of hopefuls from around the nation competed in the cadet, under 17 age group at the USA Fencing Junior Olympic Championships in Denver, Colorado, over the weekend. Haddad is a member of the D.C. Fencers Club in Silver Spring, Maryland, and attends Montgomery Blair High School, where he is a junior in the Science, Mathematics and Computer Science Magnet program. He loves physics and computer science and was active in various activities, such as with the logic team, before fencing became a five-nights-a-week and weekend commitment. Haddad has traveled all over the country and internationally for fencing tournaments. He started the sport when he was 7 and was put in a class with his sister, who is three years older. The coach thought it’d help with family travel logistics, but Haddad believed it accomplished much more. Note: The above video contains both the semifinal and final bout. The final match between Justin Haddad and his opponent, Daniel Shifron, begins at 36:48. “I think that really helped me develop as a fencer to be in the older kids’ group. Because, not only was I doing the harder things and fencing the better fencers, but I’m also — like my mom said — learning to deal with loss,” Haddad said. “It taught me that it’s OK to lose and to learn from your losses,” he said. As for what’s next? Justin Haddad can envision for himself a path similar to one taken by a fellow fencer at his club who majored in physics in college and ended up as a mathematician with the U.S. Census Bureau. More immediately, Haddad will be representing the U.S. in two weeks at the Pan American Fencing Championships in Bogota, Columbia, where he’ll be fencing on the cadet (under 17) and the junior (under 20) teams. Meanwhile, a Loudoun County teen, Michaela Joyce, took home the silver medal in the women’s under-17 age group. 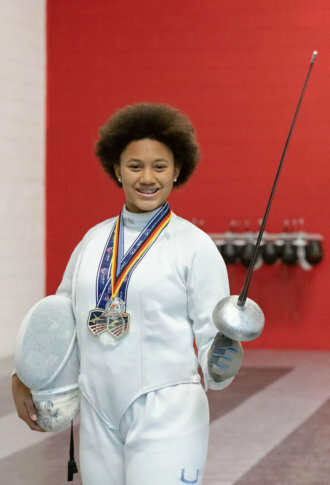 Joyce, 14, defeated two other D.C.-area fencers to win the silver medal. She was defeated for the gold by 19-year-old Dariya Yefremenko of the University of Notre Dame. Joyce is a member of the Cardinal Fencing Academy in Sterling, Virginia. Her silver-medal win brought her just short of qualifying for the world championships, which will be held in Poland in April.